As part of a planned network of hydrogen-fueled Air Taxis, DLR’s HY4 four-seat airplane will initially land at one of 60 fields in Germany outfitted to supply its unique needs. These fields will have hydrogen storage and fueling systems for ground transportation, making for a large web of clean transportation by air and land. With various car manufacturers promoting their hydrogen vehicles, it would be easy to see hydrogen aircraft landing, passengers departing in H2-powered cars, and even hardy explorers pedaling to and from the airport on their H2 bikes. One bicycle maker is planning to be part of the 60-airport plan. The Linde Group showed off its innovative pedelec (“pedal electric cycle”) this week. Instead of a battery, it gets power assistance from a compact fuel cell which generates electric power from hydrogen and oxygen taken from the surrounding air. The “highly efficient and zero-emissions drive system supports assisted pedaling over a range in excess of 100 kilometers with a single, 34-gram cylinder of hydrogen” according to Electric Cars Report. After traveling the claimed 62 miles, the rider can refill the cylinder in less than six minutes. A consortium including Linde, Daimler, Air Liquide, OMV, Shell and Total have a plan to expand the current 15 H2 filling stations now in Germany to 400 by 2023. The partners intend on deploying 100 such stations over the next four years. 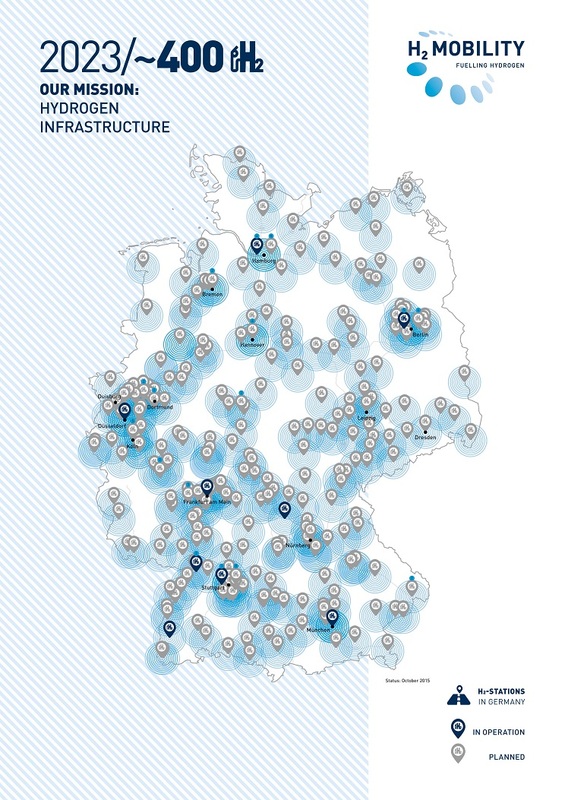 They also intend to expand this network to not just urban areas, but to rural sites, probably including airfields. OMV, one of the partners, provides the following primer on the fuel. 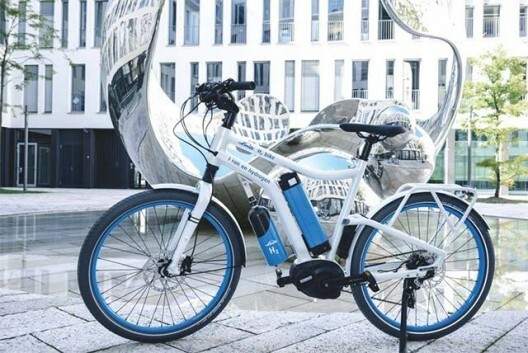 In the meantime, Linde will produce the bikes as a limited prototype series, but others have investigated the plausibility of swapping H2 for batteries, including cycleries in Australia and France, as reported here previously. One advantage Linde claims is that of obtaining its hydrogen “through the electrolysis of water using wind energy or by reforming biogas,” giving their H2 a “greener” profile than gas obtained from “mixed energy sources” common to the existing German energy grid (or from being extracted in fossil-fuel production). This implies that refueling stations might make their hydrogen on-site, allowing total independence of operation with local solar or wind energy resources. H2 Mobility Deutschland has the prospect of several car makers readying production of hydrogen-fueled vehicles – what they foresee as series production. Investments from several major players in the automobile and fuel supply markets would indicate a seriousness of purpose and a definite business plan underlying the effort. For green aviation, this would be a great resource for low-cost, clean fuel and no worries about battery recycling or disposal. We wish all the partners good fortune in their endeavors.